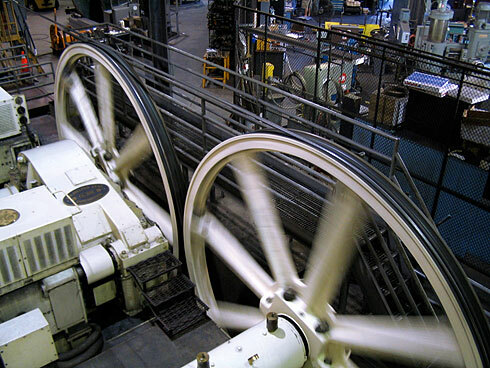 Even before I stepped inside, I heard the rumbling, churning sound of the massive sheave wheels, the source of motion for all of the cable cars in San Francisco. And although I didn’t know it at the time, I too would soon be harnessing that power as I rode a cable car westward toward Golden Gate Park. I also didn’t know about the hilarious bright-red guy… but we’ll get to that. 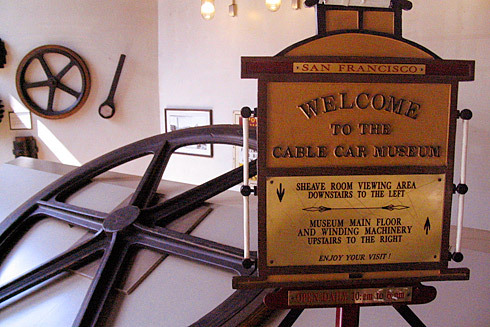 First, let’s explore the origin of this power: the Cable Car Museum, for within the museum is the mythical powerhouse that drives the cable car lines. And as you’ll soon realize, the Cable Car Museum is a must see. It’s free, it’s educational, and it’s a blast. Even the welcome sign has something to teach us. I decided to wait until the end to checkout the Sheave Room downstairs. First, I would investigate the rumbling sound coming from deeper inside. And since the sign had introduced me to a new word, I also needed to find out what a “sheave” was. As I proceeded inward, I soon realized the source of the sound I’d been hearing. There was a powerhouse just below me. Of course! The source of the sound I’d been hearing was the very source of motion for the cable cars: the winding machinery, which consists of the electric motors, the cables, and the sheaves. I should probably clarify here. 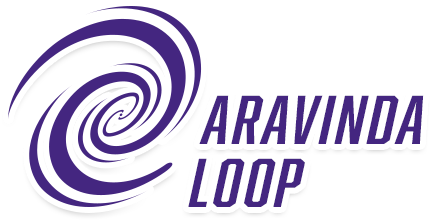 A “sheave” is a wheel with a groove for a rope to run on. When connected to an electric motor, as in the case above, a series of them can be used to power cable cars around the city. And these sheaves are constantly spinning at a leisurely 9.5 mph. 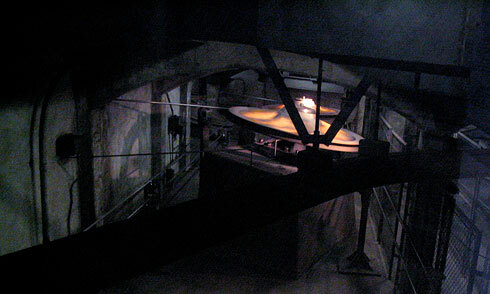 In fact, four separate cables were being routed through the cable car powerhouse below me, and a sign nearby explained that each were supported by large sheaves and hundreds of small pulleys as they moved in channels under the San Francisco streets. 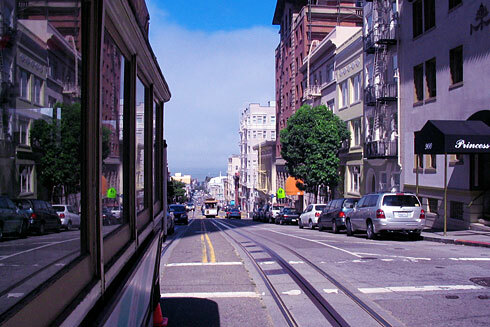 To move, each cable car had a grip mechanism that, when used by the gripman, would grab onto a cable running just below the street to pull the car along. The system, while designed over 100 years ago, was nonetheless amazing. Soon, I came across this 6 ton giant. Grip car #46 (pictured above) was part of the Sutter Street Railway in the 1870s. Apparently, during the heyday of cable cars from 1880 to 1906, nine different railroad companies operated twenty-two cable car lines throughout the city. Competition was rife, and to prevent other operators from using their tracks, each company used different track widths. Of course, the heyday didn’t last forever, and by 1956 the tracks for the three remaining lines were absorbed into San Francisco MUNI and standardized to work together. Whatever company grip car #46 had belonged to, it was well-preserved; and I tried to imagine this car going down the streets of a much younger San Francisco without all of its modern skyscrapers and tech company giants. Obviously, it was quite a different world back then. 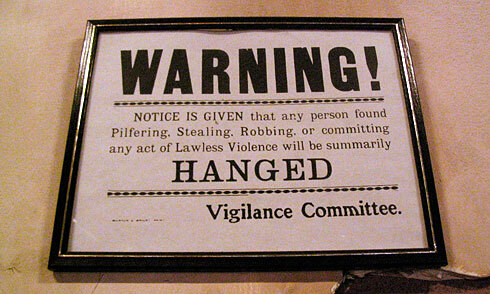 We need look no further than a nearby sign threatening the hanging of thieves (pictured above) as an excellent example of how society has changed. I’m not sure where this was posted originally, but I doubt it was created for the museum since it was founded in 1974. Eventually, I made my way down to the sheave room which routed the cables under the street. It was quite a feat of engineering, and I found myself staring at half a dozen or so wheels as they spun with an almost hypnotizing rhythm. What would it feel like to harness that power? I decided to head back up the stairs to street level and find out. After waiting a few minutes, a cable car approached, and I jumped at the opportunity. It was already pretty full, but I’d never done this before and knew this was something I had to do while the opportunity was fresh. Somehow I found a comfortable seat on the side. Ahead, I saw the gripman use the huge grip lever to clamp onto an unseen cable below the car, and soon we were roaming up one of San Francisco’s hills with ease. As we sped along at a smooth 9.5 mph, I held onto a grip and hung out from the cable car a few feet, resembling a rhesus monkey as I snapped some photos. Below, I noticed that another cable car track ran parallel very near to the track we were on. Soon, I realized the interesting ramification of this as another cable car passed very close by us. So close, in fact, that I had to put my backpack on over my stomach so we could pass by without bumping elbows with anyone in the other car. I’m not sure if this is a common problem, and if our car hadn’t been so packed, it wouldn’t have been such a squeeze. Seeing the city by cable car is a unique and unforgettable experience. As we headed west toward Golden Gate Park, we passed construction projects, city monuments, famous hotels, and this hilarious man in a red suit (pictured above). 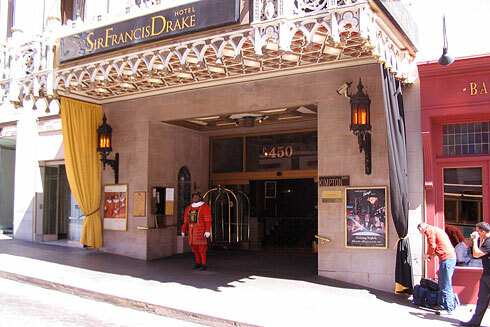 Now, at the time I didn’t know anything about the Sir Francis Drake Hotel, but later I learned that they require all of their doormen to wear these hilarious “beefeater” uniforms. Apparently, they’re going for a Medieval theme… or Alice in Wonderland. Either would work. Anyway, this guy fit into his surroundings about as well as a Bengal Tiger would have. Soon, we were near the Haight-Ashbury intersection, just a few short blocks from Golden Gate Park. I jumped off the cable car and asked the gripman what I owed him. He waved his hand and told me it was free. Perhaps he could tell I wasn’t from the city, or perhaps he’d gone over capacity and already filled some kind of quota. 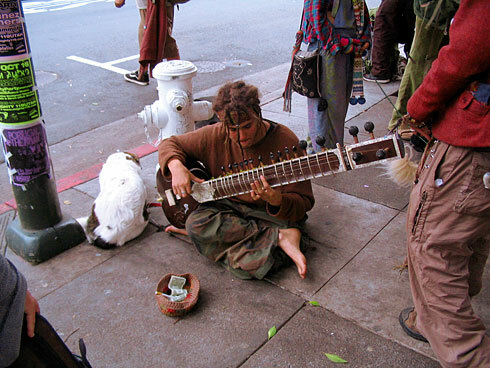 In either case, I was grateful for his generosity; and as I walked west along Haight Street, exotic sounds of a street performer playing a sitar floated through the air. The wonders of the Japanese Tea Garden were just ahead. It will not surprise long time readers to hear that Marco the Spacefarer continued to follow me on that day and therefore appears in all 15 photos in the accompanying photo gallery. If you’re new to the “Where’s Marco” game, it’s similar to “Where’s Waldo” or “I Spy”, and it’s totally fun! 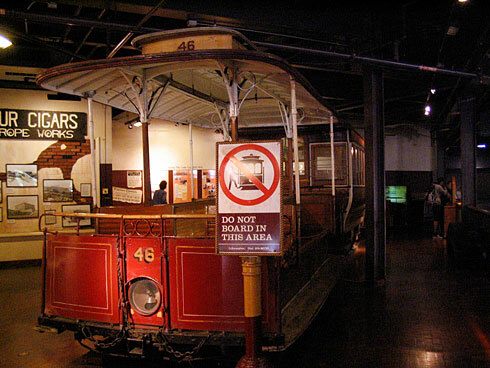 All accompanying photos are in the Cable Car Museum photo gallery. 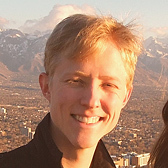 With so much free, high-quality content, why not tell a friend and share this article? It looks like you had quite the trip. Now, I’ll have another place to go visit when I make my trip down to San Francisco this fall. Thanks for sharing your experiences! As I can see through your pics, you really have a good time on that trip. 🙂 Nice shots! Thanks for sharing this.. I did not know that the entire cable car system was run from a central point… how incredibly fascinating! …and somewhat terrifying. It reminds me of some type of hive-mind type of creature. When are you going to have your SF city page up? It’s one of my favorite cities in the world and I’d love to read all the articles together. This is really cool, I love the image of a cable car cruising along the street with people hopping on and off. It is elegant, graceful, fun, and so San Francisco. What a great museum, I wish I could have the time to visit it soon! I am a great fan of cable cars! It is pretty amazing to watch the functionality of the cable cars. The system is a marvel of engineering and it is astonishing to learn that it is a century old. I would love to be able to hang out in that place. Nice pictures and great story.